Bead, iolite (dyed), 7x6mm-10x7mm hand-cut faceted rectangle, B grade, Mohs hardness 7 to 7-1/2. Sold per 16-inch strand. Item Number: H20-7941GS Have a question about this item? 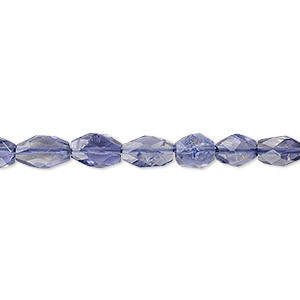 These beads are a shimmering sapphire blue/violet color. The gem version of the mineral cordierite, it is often called "water sapphire." Sizes, shapes and colors may vary with handcrafted items. 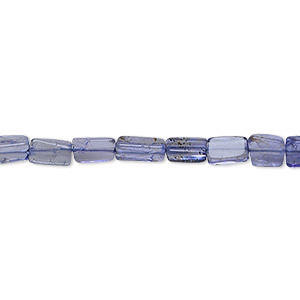 Bead, iolite (dyed), 5x3mm-7x5mm hand-cut rectangle, C grade, Mohs hardness 7 to 7-1/2. Sold per 15-1/2" to 16" strand. 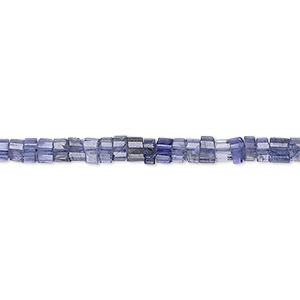 Bead, iolite (dyed), 5x2mm-6x3mm hand-cut faceted rondelle, B grade, Mohs hardness 7 to 7-1/2. Sold per 15-1/2" to 16" strand. 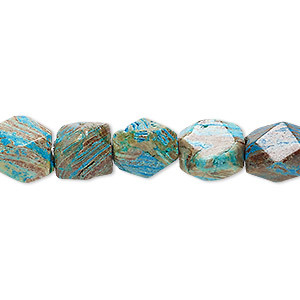 Bead, blue sky jasper (dyed / stabilized), 10x8mm faceted rectangle, C grade, Mohs hardness 6-1/2 to 7. Sold per 15-1/2" to 16" strand. 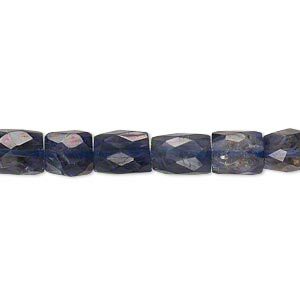 Bead, iolite (dyed), 6x5mm hand-cut faceted oval, B grade, Mohs hardness 7 to 7-1/2. Sold per 15-1/2" to 16" strand. 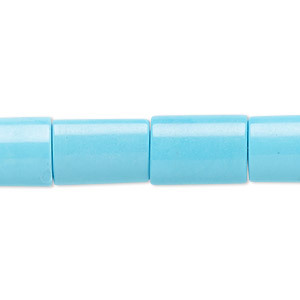 Bead, magnesite (dyed / stabilized), blue, 14x10mm rectangle, B grade, Mohs hardness 3-1/2 to 4. Sold per 16-inch strand. 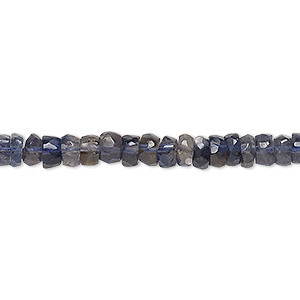 Bead, iolite (dyed), 4x2mm hand-cut faceted heishi, B grade, Mohs hardness 7 to 7-1/2. Sold per 15-1/2" to 16" strand. 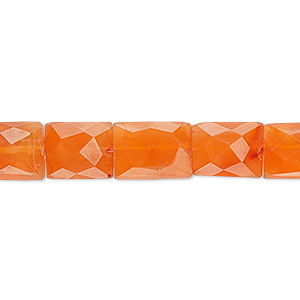 Bead, carnelian (dyed / heated), 10x8mm-17x11mm hand-cut faceted rectangle, B grade, Mohs hardness 6-1/2 to 7. Sold per 15-1/2" to 16" strand. 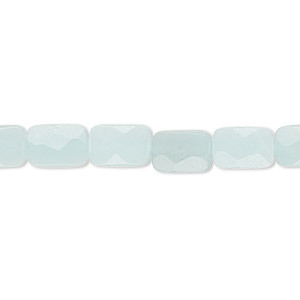 Bead, amazonite (natural), 9x6mm faceted rectangle, B grade, Mohs hardness 6 to 6-1/2. Sold per 15-1/2" to 16" strand. 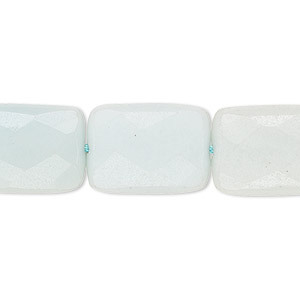 Bead, amazonite (natural), light and dark, 18x13mm faceted rectangle, B grade, Mohs hardness 6 to 6-1/2. Sold per 15-1/2" to 16" strand. 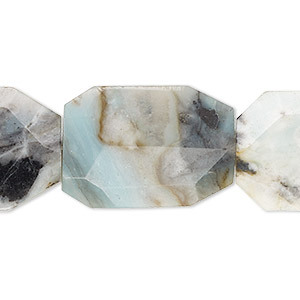 Bead, amazonite with black tourmaline (natural), 35x25mm faceted flat rectangle, B grade, Mohs hardness 6 to 6-1/2. Sold per 15-1/2" to 16" strand.